Ben was upset when his friend Peter moved away, but now the new neighbors are moving in across the street and Ben can't wait to go say hello and make friends. That is, until he notices that this family has a pet dog; and unlike his sister and brother, Ben isn't so sure around dogs. The big jaws and big teeth make him nervous. But what Ben doesn't realize is that Max is an "old scaredy-dog" who feels nervous too. Can Ben overcome his fear and come to see eye-to-eye with a new kind of friend? 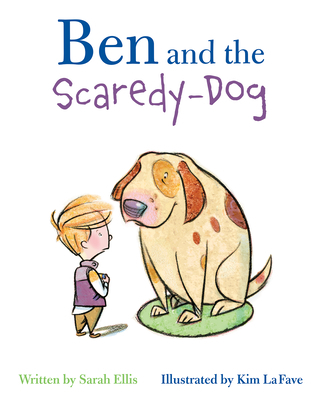 The award-winning team that produced A+ for Big Ben and Ben Says Goodbye have come together once again in Ben and the Scaredy-Dog, a heart-warming story about a thoughtful yet anxious boy who overcomes his fear of dogs. Sarah Ellis highlights the all-too-common childhood dread of canines as she once again explores the world through the eyes of Ben, a boy who wants to be brave but just can't help anticipating the worst when it comes to a new experience. Kim La Fave perfectly captures his characters' thoughts and intentions through spot-on expressions and body language, as he contrasts Ben's drawings of the creature he sees in his mind's eye with the reality of the big and cuddly dog next door, who just happens to have his own fear issues. The result is a gently funny book that explores the courageous heart that can be found within an anxious child.